One win from title town!! 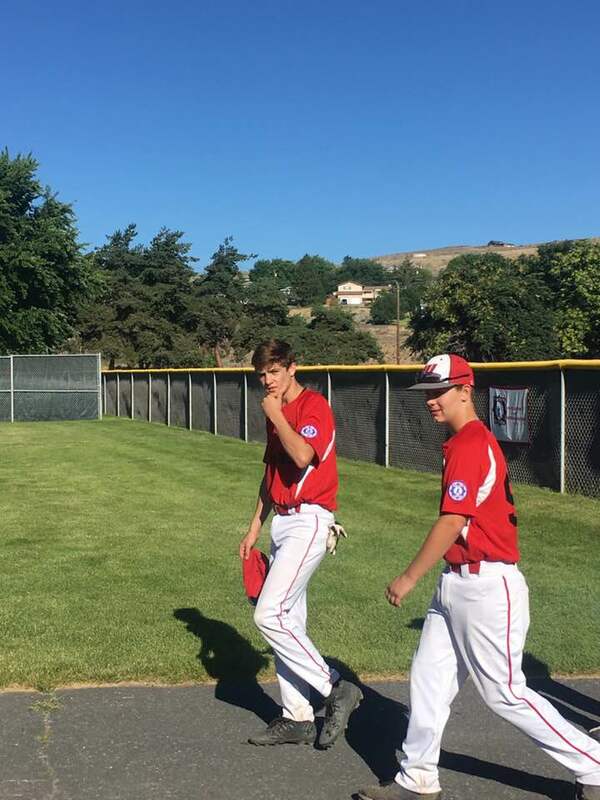 Facing the defending state champs, down a game after suffering their first loss of the season and enduring temps soaring towards 100 in Ephrata, the Coupeville Babe Ruth baseball squad rallied Friday to keep its dream alive. After dropping a 3-2 heartbreaker in extra innings to kick off the state tourney, the Wolves roared back to blast Columbia Basin 6-2 in the afternoon tilt. With the win, Coupeville improves to 17-1 on the season and sits one win from being hailed as the state champs in the 13-15 classification. The two teams will play a third and deciding game 9 AM Saturday (likely in cooler temps), with the victor punching its ticket to the Pacific NW Regional Tournament in Portland, Oregon. Columbia Basin is one of the biggies in Babe Ruth baseball, having won three straight and four of the last five 13-15 state titles. That pedigree didn’t scare Coupeville, however, which wants to capture the town’s first state title since the 2010 Central Whidbey Little League Juniors baseball squad achieved that feat. The Wolves survived a buzzsaw in game one, whiffing 13 times on pitches by Columbia Basin hurler Kevin Rexes, yet never falling out of the game. Coupeville flame-thrower Daniel Olson was on point himself, putting nine rivals down on K’s, and the game remained close from start to finish. The defending champs pushed a run across in the second, but the Wolves responded at the last moment, knotting the game at 1-1 with a run in the top of the seventh. Olson walked, pilfered two bags, then zipped home on a passed ball to send the game to extra innings. Things got interesting there, with Coupeville taking its first lead of the game on an RBI single off the bat of Scott Hilborn. The base-knock brought Cody Roberts home, and brought the Wolf faithful to their feet in anticipation of the team’s 17th straight win. It wasn’t to be, however, as Columbia Basin rallied for the tying and winning runs in the bottom of the inning, using three walks and two Wolf errors to bust open the game. The loss came despite Coupeville out-hitting its foes, raining down six hits to four. Roberts, Gavin Knoblich, Ulrik Wells, Hilborn, Olson and Ashton Leland shared the hot bats, each chipping in with a hit apiece. With their season on the line, the Wolves responded, with their bats heating up under blazing skies. A three-run second-inning burst, fueled by singles from Olson and Johnny Carlson and fast feet on the base-paths, put Coupeville ahead to stay and it coasted home behind the one-two punch of hurlers Leland and Roberts. Once again, the Wolves spread out the love, with eight different batters ringing up a base-knock. Hawthorne Wolfe and Xavier Murdy, who ran wild on the bases, led the way, with Wells, Carlson, Olson, Hilborn, Drake Borden and Leland chipping in to the team effort. Coupeville, which is coached by Steve Hilborn and also includes Chelsea Prescott, Andrew Score and Sage Sharp on its roster, roared through the regular season, going 16-0.